Gunsmoke, a homegrown band in Darien, will perform an outdoors at Grove Street Plaza, starting at 6 p.m., Friday, July 27, in the latest Darien Summer Nights concert. The band has been playing for many different audiences for over 25 years, including for two sitting Presidents of the United States and the world famous Ernest Tubb’s Midnight Jamboree in Nashville, following the Grand Ole Opry. With six recorded albums under their belt, Gunsmoke was inducted into the Connecticut Country Music Hall of Fame, and was elected band of the year six years in a row by the New York Metro Country Music Association. Gunsmoke plays, starting at 6 p.m., Friday at Grove Street Plaza. The band was founded on family values as it was created by Nick DeMaio Jr. and his younger brother Jeff. With great fondness, we remember the many years they were joined by their father, Nick Sr. The band continues to welcome the younger family members into the band with Christina Mae and Nick DeMaio III joining the tradition. The family affair is joined by lead guitarist Van Mankas and expert fiddler Fooch Fischetti. It is sure to be a fantastic evening at Grove Street Plaza, be sure to join us this Friday. Bring your family and friends for this very special performance. The concert is from 6 p.m. to 8:30 p.m.
It’s all free. The organizers just hope you’ll shop local and patronize local restaurants. It’s outdoors at Grove Street Plaza. encourage residents to come out this summer to Darien Summer Nights at what has become an incredible community gathering. See you Friday – and remember to shop local! 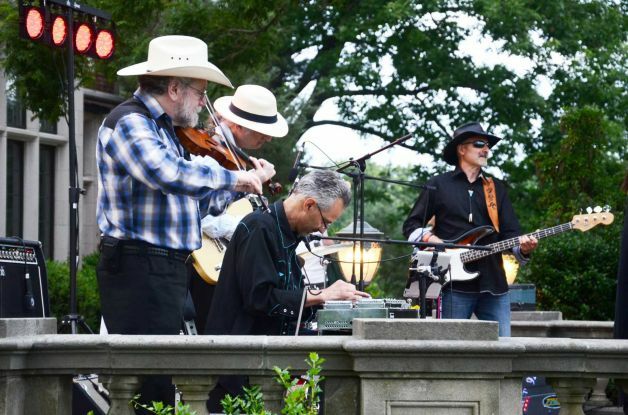 This Friday, Gunsmoke, a homegrown band is set to perform at the Grove Street Plaza at 6 p.m. as part of the Darien Summer Nights concert series. Gunsmoke has been playing for many different audiences for over 25 years, including two sitting presidents of the United States and the world famous Ernest Tubb’s Midnight Jamboree in Nashville, following the Grand Ole Opry. Award-winning pedal steel guitar artists and Nashville music performers will be performing on Saturday night, Nov. 18 at the Piedmont Club's Piedmont Lounge in Darien.